In classrooms across the country – in higher education institutions and in corporate meeting rooms – educators often find it hard to create and deliver content in a way that students find engaging and accessible. To overcome barriers to delivery, accessibility, engagement, and retention for both educators and students, Real Time Cases, Inc. and Elearis, Inc. have partnered to combine innovative experiential learning content and an easy to use course-delivery platform, so educators can more easily create, innovate, and transform lesson plans for the lecture hall, the lab, or the training room. Real Time Cases creates video-based and interactive business-case scenarios with 40+ corporate partners to offer current, authentic, and relevant course materials for a more approachable and engaging learning experience than traditional case studies. Elearis offers a technology platform that educators use to build online course materials easily by dragging and dropping pictures, graphics, videos, documents, animation, and other content. Elearis also provides educators with custom iPad/Tablet Apps for anytime, anywhere access. As both companies offer complementary solutions, partnering lets them provide relevant educational materials to educators and students in a format they want, whenever and wherever they choose to access it. By working together, the companies offer an innovative approach to learning, which utilizes a modern and relevant insight into real-world business problems combined with a next-generation software platform. The partnership allows instructors in any learning environment to quickly and cost efficiently generate lessons or entire courses that allow students to learn at their own pace and retain more knowledge via video. The end result is learners who are smarter and more competitive. The Real Time Cases library of 200+ case studies now will be accessible through the Elearis cloud-based platform, offering educators and trainers the opportunity to incorporate them easily into customized coursework. 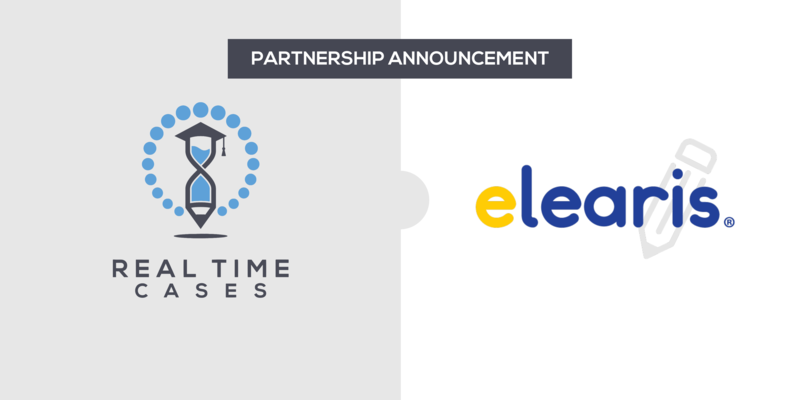 The partnership enhances both Real Time Cases’ and Elearis’ products by removing traditional barriers between content and technology and creating more options for educators to create more dynamic coursework to support the curriculum. By creating a seamless experience for instructors, Real Time Cases and Elearis offer a way to create and disseminate lessons faster and focus on what matters most — engaging the learner.